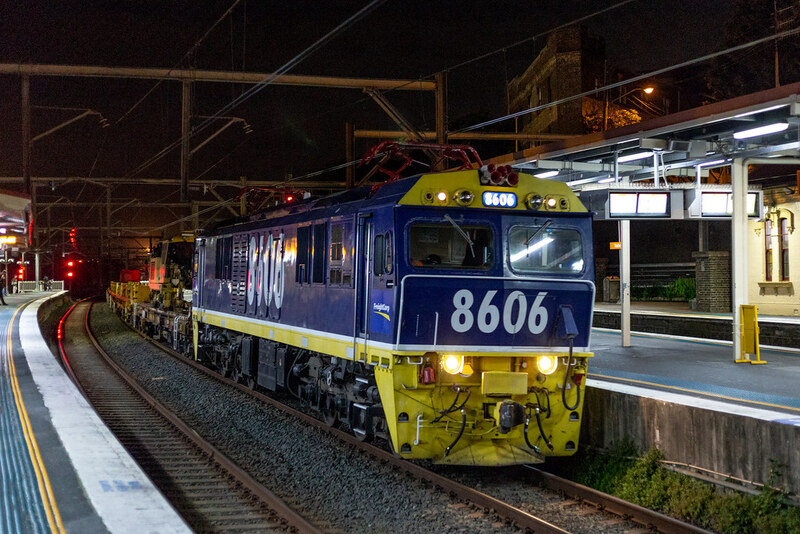 Sydney Electric Train Society's electric locomotive 8606 has recently been returned to operating status by Pacific National, Progress Rail and Transport for NSW. After ongoing reliability testing it finally worked a works train on 29 October 2018. Seen here E702 passes through Redfern on the Up Suburban, where it will enter a possession over the Down Shore Line after Central. The train would then proceed to North Sydney to drop rail at Platform 4, and later return back to the tunnel between Wynyard and Town Hall to drop rail. The Robel Railset was used for this work. The electric locomotive has been specifically chosen to remove exhaust emissions from the under, which has constantly been a problem over the years since Electric Locomotives were withdrawn from front line use.